If you want a short introduction/motivation to this topic, you may want to have a look at the slides I prepared for the Inria days in June 2016 and which are riddled with pointers. I organize a series of webinars on this topic, where I invite colleagues to expose their view on specific subjects. You'll find many useful information in there. The Truth, The Whole Truth, and Nothing But the Truth: A Pragmatic Guide to Assessing Empirical Evaluations. I particularly like Figure 10 and Section 7 that summarize quite well what I feel is happening in our community regarding publication bias. 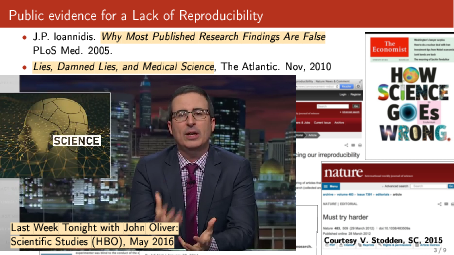 A manifesto for reproducible science in Nature. Should computer scientists do more experiments? (16 excuses to avoid experimentation). A 20 years old paper with pretty sound remarks that are still completely relevant to day! Producing wrong data without doing anything obviously wrong! (Amer Diwan et al.). A good example of bias induced by pseudo-replication in computer performance measurement. "Measuring reproducibility in computer systems research" (Collberg et al.) (website) A very nice meta-study about the state of reproducibility in our community. Implementing Reproducible Research edited by Victoria Stodden, Friedrich Leisch, Roger D. Peng. This book is somehow a follow up of the AMP workshop mentionned later on. It provides with many interesting references and point of views. Unfortunately, the collection of chapters by different authors leads to some overlap and lacks a somehow unified view/presentation. Still, this is an interesting effort that provides a lot of pointers and related work. The Canon: a collection of readings on experimental evaluation and "good science". How computers broke science – and what we can do to fix it. I like the content but not much the title though. Workshop on Duplicating, Deconstructing and Debunking (WDDD) (2014 edition). A very early workshop around this subject. Artifact evaluation in the ESEC/FSE conference. 1st workshop on Reproducibility of Computation Based Research: Languages, Standards, Methodologies and Platforms (Joint event with NTMS15). Enric Meinhardt-Llopis, ENS Cachan: IPOL : Recherche reproductible en traitement d’images. A great talk! Talk on “Open access publishing: A researcher’s perspective” by Karl Broman. I really like the first part of the story where he desperately tries to access some paper. On the python side, there is matplotlib, which is by comparison very low level. It can provide very nice graphics but it's way less expressive. Sectionning is difficult as projects span different aspects. Burrito is a tool that monitors and logs your activity so that you can possibly come back to previous situations. CDE (slides from the AMP workshop) and CARE are tools that help you packaging code so that it can be rerun by others. There is also a recent effort (by the vistrails team) called ReproZip that trace dependancies and files and relies on VM and Vagrant to reproduce the environment. Undertracks (ad hoc platform initially designed at the LIG for studies on technology-enhanced learning systems). Framesoc and a trace archive (I'm somehow involved in these projects). RunMyCode. This project was initially meant to allow to re-run the code of articles but is now merely a data/src hosting platform. Konrad Hinsen explained me there had been a fork and that the execution part of this project had now moved to the execandshare project. http://f1000research.com/. Something I particularly like is the open review principle. Look for example on the right of http://f1000research.com/articles/3-289/v3/ On this topic, one may be interested by https://opennessinitiative.org/. Worried about copyright issues and journals annoying you when making all your work freely reproducible? I enjoyed Lorena Barba's experience report about this (last question). Distill : a moderne Machine learning journal ? Allowing new kind of papers that combine the flexibility of "basic research" with the rigour of clinical trials. Why should I believe your supercomputing research ? Confidence in an instrument increases if we can use it to get results that are expected. Or we gain confidence in an experimental result if it can be replicated with a different instrument/apparatus. The question of whether we have evidence that claims to scientific knowledge stemming from simulation are justified is not so clear as verification and validation.